On Sunday 6 April I gave an online presentation for the half day MiniCon, one of two events leading up to RSCON5. The official online conference, RSCON5, takes place July 11-13th, 2014 and will feature 60+presentations, 2 plenaries, 10 keynotes, student presenters, a tech/app/lesson smackdown, and the EdInspire Awards Ceremony. Make a note of the date! This event featured Keynote, Steven W. Anderson @Web20Classroom, eight international speakers from six different countries, an exciting technology smackdown and sharing of tools for learning. The event was hosted by the lovely Shelly Terrell @ShellTerrell. Thanks Shelly for making us feel so welcome! The conference was held online using the Blackboard Collaborate webinar platform. People worldwide attended this online event for free from anywhere with Internet access, including their mobile devices. Participants were able to use the chat facility to leave comments/ask questions. The event was also recorded so there is still time to watch it! 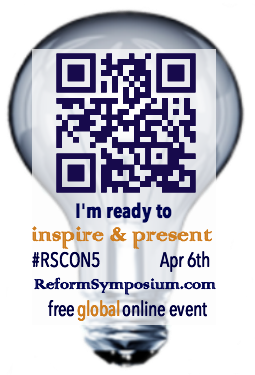 Alongside the webinar the Twitter back channel was lively via #RSCON5. To say it was a 'minicon' the event was far from mini and jam packed with useful tips. It was a tremendous opportunity to learn from other educators and share ideas. Steven a reknowned speaker worldwide in the education field and beyond, spoke about how technology is at the finger tips of our children and used for both entertainment and learning. Talking about introducing technology into teaching and learning Steven said "using technology takes guts". As educators, learning about how we can enhance learning and teaching is now possible by building our own personal learning networks. By connecting to other educators across the globe we can share and develop ideas together. The Inspire Speakers who followed gave rich examples of just how this can be done. You can find details of all their talks below and listen to the recorded webinar. I would also recommend you follow these Educators on Twitter. My presentation highlighted the importance of a professional online presence, what this might look like, and how to achieve it. Description: "For children and adolescents digital media and the internet don't mean technology, but natural environment and culture." - For a 21st century learner, it is important to create and share content and connect, collaborate and learn from and together with others - sharing is caring! Description: This presentation will highlight the importance of a professional online presence, what this might look like, and how to achieve it. Description: In this short presentation, I'll introduce FlipQuiz (www.flipquizme.com) and explain how I use in the class and tell how my students react. Description: Memorising language chunks creatively helps students to develop fluency whilst improving critical thinking skills. The ideas are short, practical, and based on experience, research, educational psychology , technology and best practice. and experimentation. Inspired by literature, poetry, arts, mnenmonics, mindmapping, visual thinking, and multi-sensory associations. * students picked their own projects? * thinking about their own learning was exciting to students? * class was so interesting students voluntarily showed up early and stayed late? Want to find out? Join me to look at my class! Description: This session will explore online apps and tools for building students' writing skills. It will focus on tools that allow students to work collaboratively and encourage networking and social interaction. Tools covered during the presentation will include Google Apps, blogging programs, and social media formats including Edmodo and others. Description: This session highlights Weebly.com. Weebly allows you to create a class website, ePortfolio, publish announcements, tips and reminders for parents and students. Share your work and the work of your students by highlighting classwork, community service activities, awards and recognitions. • Maker education lends itself to 100% engagement by 100% participants almost 100% of the time. • Age levels and gender are blurred; does not affect participation, engagement, and interest. • Maker education has roots and traditions in progressive and experiential education. • Maker education is self-differentiating. Title: Creative Writing can be taught! Description: Is it true that writing is the most difficult skill for L2 learners? In this presentation, we will see the factors to consider when teaching writing, build on what the best practices should be based on teachers themselves and their experiences, and use some activities to develop students’ creative writing. I was thrilled to find that the day after my talk had been selected as a featured presentation on Slideshare. Remember the official 3 day FREE online conference, RSCON5, will take place July 11-13th, 2014. To find our more visit the conference website.